Some of the cofounding myths we believe can be very dangerous. Why? Because they might cause you to make grave mistakes when building your own business. We will look at the most dangerous and frequent ones – so you will be able to do the right decisions based on the right information - for your own business. Would you think that most unicorns are built by solo flyers? Or teams? Looking at most valuable companies of today suggests that building a profitable and lasting business is a – cofounder team effort. 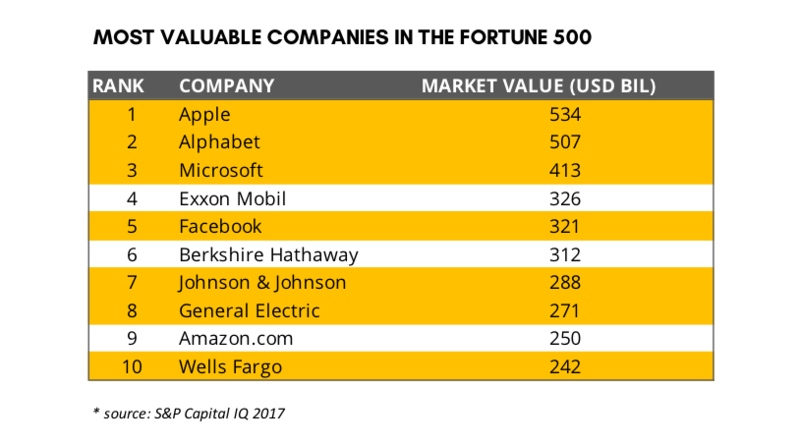 The table below list the most valuable companies measured by market capitalization in 2017 – with yellow highlight for companies started by multiple cofounders – 7 out of 10. We seem to have an idealized notion of the lonely solo founders who built an imperium from nothing. The truth to be told though, they rarely did it by themselves in all the stages. Building a business requires a lot of skills, resources and perseverance. To find the sufficient quantity and mixture of all under one hat – is an exception, not the rule! Even Steve Jobs started with Steve Wozniak. Done right, there are powerful synergies to be created in a team – by joining resources, knowledge, brains and hearts – that go way beyond what anyone can achieve on their own. You can also achieve part of these with having employees, but for example - the shared responsibility (it is not everything on your shoulders only) or sound boarding your ideas (requires often peer level not hierarchy) – are few examples which are much harder to achieve outside of a cofounding team. There is a vast body of psychological and business research confirming that a) As homo sapiens we are meant to cooperate and b) looking at the results, we are very bad at it. According to several studies – from statistical data mining to empirical investors and experts’ observations – between 60-70% of start-up failures are being attributed to problems within the cofounding team. In my own experience the cofounder issues are not only demonstrated by straight flat failure of the business – they impact the business performance or the ability to attract clients, talent or investors. Whilst not killing the business directly – cofounding teams that don’t work make the business underperform, on all levels. Although there are some famous companies who survived their cofounding issues (and made a great movie material such as the story of Facebook), there are many more of which we never heard of because they did not survive. So, while it might be strategic choice to start your business as a team – the ‘how’ is not to be underestimated. Hearing this especially from the – oh so many – entrepreneurs whose previous business partnerships have failed, or the current ones are failing – partnerships are claimed to be too risky. - The business risk: all the lost and sunk resources is the most obvious one. - Then relationship risk: many – especially first-time founders look for cofounders in their family and friends circle. And it is these relationships which could be (irreparably in many cases) damaged. - The lost opportunity risk: when the entrepreneurs either completely abandon the mission or decide to start or continue solo, thinking that partnerships are too risky. Having worked with 100+ cofounding teams as a mentor – I am a strong believer in business partnership and its benefits. As an investor – it is the cofounding team I will evaluate as first before moving to the next due diligence steps. My advice to all the founders and entrepreneurs out there is: do consider if partnership is the right thing for you and if it is – do not think it is easy but also do not be afraid – learn how to do it right instead. Wasserman , N. (2012). The Founder's Dilemmas. Princeton & Oxford, USA : Princeton University Press.